Cet article examine l’évolution des liens transnationaux des organisations migrantes avec les partis politiques de la gauche radicale aux Pays-Bas depuis les années soixante-dix. Il montre la diversité des trajectoires des organisations migrantes orientées de manière transnationale : certaines perdent leur caractère radical contrairement à d’autres qui le maintiennent. Nombre de facteurs déterminent, selon la littérature, l’engagement politique transnational : les raisons à l’origine de la migration, la structure des opportunités politiques dans le pays de résidence et dans le pays d’origine et la durée de séjour des migrants. Toutefois ces facteurs ne permettent guère d’expliquer la diversité des trajectoires, puisqu’ils concernent de la même manière toute la gauche turque et, dès lors, ne peuvent rendre compte des différences à l’intérieur de ce courant politique. Les raisons de ces changements sont à chercher ailleurs. L’analyse montre que les organisations migrantes ne deviennent des véritables organisations de migrants que lorsque leur organisation parallèle au pays d’origine a pris une option politique qui ne rend plus nécessaire un soutien de l’étranger. Au lieu de considérer que les opportunités politiques du pays d’origine concernent tous les groupes, l’on doit s’interroger sur la manière, dont certains groupes, appartenant parfois au même courant politique, sont inclus ou exclus de la participation politique dans le pays d’origine. Enfin l’article montre que contrairement à une opinion largement partagée, il n’y a guère d’indications selon lesquelles un intérêt soutenu dans le devenir politique du pays d’origine est un frein à l’intégration politique et constitue une menace pour la démocratie aux Pays-Bas. This article examines evolution of migrants’ organisational transnational ties with political parties of the Turkish radical left in the Netherlands since the 1970s. It shows that trajectories of transnationally orientated migrant organisations with a shared political orientation differ substantially from each other. Some lose their radical edge over the years whereas others do not. The factors that existing literature commonly identifies as shaping transnational political involvement —migration motives, political opportunity structures in the receiving country and the (former) homeland, and migrants’ length of stay— are insufficient to understand this pattern. They apply to the whole Turkish left in similar measure and therefore cannot account for variation within this political stream. Explanations for the changes in patterns of transnational political ties over time hence need to look further. This article argues that migrant organisations only become true migrant organisations once their sister organisation in the homeland has chosen a political path that has made support from abroad obsolete. Instead of assuming that homeland political opportunities similarly affect all groups, we need to ask how specific groups —even within a comparable political stream— are included or excluded from homeland political participation. Finally, this article shows, that —contrary to what is generally assumed— in this case there is no indication that maintaining interest in homeland politics today hinders political integration or threatens Dutch democracy. Ese artículo observa la evolución de los lazos transnacionales de las organizaciones migratorias con los partidos políticos de la izquierda radical turca en los Países Bajos desde los años setenta. Muestra que las trayectorias de organizaciones de migrantes con orientación transnacional pueden discrepar fuertemente entre ellas. Algunas pierden su carácter radical con el paso del tiempo mientras otras no. Los factores explicativos del compromiso político transnacional sobresalientes en la literatura — motivos de migración, estructuras de oportunidad política en los países de origen y de acogida, y la duración de la estancia — no son suficientes para entender ese fenómeno. Se aplican de la misma forma a la totalidad de la izquierda turca de suerte que no nos permiten entender las variaciones que ocurren dentro de esa corriente política. Para entender los cambios en las redes políticas transnacionales con el tiempo, hay que buscar otro tipo de esclarecimientos. Mostramos que las organizaciones de migrantes se vuelven verdaderas organizaciones de migrantes una vez que la organización gemela del país de origen escoge una vía política que hace inútil cualquier asistencia de afuera. En vez de asumir que se dan las mismas oportunidades políticas a todos los grupos, debemos preguntarnos como grupos específicos — aunque de la misma corriente política — puedan participar o no a la política en su país de origen. Y, finalmente, mostramos que al revés de lo que se pretende, no tenemos elementos para apoyar la idea que el interés mantenido en la política del país de origen sea un obstáculo a la integración o una amenaza a la democracia holandesa. I thank Rinus Penninx and Daniel Mügge for their comments on earlier versions of this paper and David Takeo Hymans for editing it. Fieldwork in Turkey from November 2004 till January 2005 was made possible through a travel grant (number R 52-1077) of the Netherlands Organisation for Scientific Research (NWO). 1Migrants’ transnational loyalties and practices are the subjects of hot political debate in many European countries. Critics often worry about the influence of political transnationalism on domestic politics: do migrants ‘import’ foreign government influence? Does political transnationalism threaten democracy? If migrants and their descendants are actively involved in homeland politics does this signal indifference towards politics in their countries of residence? Does political transnationalism thereby hinder integration (as for example is stated by Koopmans, Statham, Giugni and Passy, 2005)? 2These are big questions. They are also loaded questions, asked from the perspective of European governments. But the consequences of political transnationalism can only be understood once the phenomenon is studied transnationally – by examining causes and effects in both receiving countries and the in countries of origin. 3Extant scholarship has identified a number of factors that play an important role in the evolution of transnational politics. In particular, these include political opportunities in the country of settlement and/or in the country of origin (Koopmans, Statham, Giugni and Passy, 2005; Koopmans and Statham, 2003; Ögelman, 2003; Østergaard-Nielsen, 2003); migrants’ length of stay (Foner, 2001; Guarnizo, Portes and Haller, 2003; Morowska, 2003; Al-Ali, Black and Koser, 2001); and their migration motives (Østergaard-Nielsen, 2003). The scholarship has also shown that organisations often form the backbone of political transnationalism; because they channel individual activities, organisations are central in many studies (Ögelman, 2003; Østergaard-Nielsen, 2003; Argun, 2003). In important ways, then, understanding organisational patterns becomes synonymous with understanding political transnationalism itself. 4Organisational patterns – and the transnational activities they channel – change over time. Once migrants settle permanently, some organisations disappear while new ones are formed. The political focus of migrants’ organisations also shifts, often (though not always) towards issues in the country of settlement. At this most general level, many studies of transnational politics ask a deceptively simple question: what explains this variation – over time, between different migrant communities, and between different organisations and political currents? 5This paper follows this line of analysis with a sharpened focus. It addresses the evolution of radical left transnational political organisations among Turkish migrants in the Netherlands. Within this political segment, trajectories have differed markedly. Many radical organisations, particularly in the late 1970s and early 1980s, were short-lived. Of the organisations that still exist, some have become more moderate; others have retained their radical edge. The focus of these radical organisations has also shifted over time: many have grown more interested in the position of their members in Dutch society than in political conditions in Turkey. This, however, is not true for all of them: a number of organisations retain their ambition to influence Turkish politics. This variation, then, forms the core empirical puzzle of this paper: what explains the different trajectories of transnationally active radical left Turkish organisations in the Netherlands? 6While political opportunities, migration motives and length of stay are relevant to our case, they cannot, in themselves, explain important differences between the political trajectories of different leftwing Turkish migrant groups. For most of the groups studied in this paper, the above factors have been similar or have remained constant. For example, virtually all radical left movements were outlawed in Turkey after the coup in 1980. Many of the migrant organisations studied here were set up in similar times, under similar conditions, by people with similar migration motives. And while the political climate for left movements in Turkey has changed several times over the past decades, the effect on migrant organisations abroad should have been roughly comparable. So what explains the variation between the trajectories of these organisations? 7Many migrants are not only active transnationally; they are also organised in transnational networks. Most leftwing Turkish migrant organisations maintained active contacts with their counterparts in Turkey, or with those in exile in other European countries. In many cases, organisations in the Netherlands functioned as branches of movements in Turkey. Conversely, movements operating clandestinely in Turkey had their operational bases abroad. As an organisation, however, the Turkish and (in this case) Dutch branches co-operated closely. Under which conditions were organisational structures in the Netherlands directed from Turkey? For organisations in the Netherlands without legal counterparts in Turkey, the opposite question arises: under which conditions were organisational structures determined by political opportunities in the Netherlands? And how did political developments in Turkey influence organisational structure? Did organisations in the Netherlands survive developments in Turkey, or did they change their goals and activities? 8To answer these questions, the next section provides a broad historical sketch of left political movements since the 1960s, focusing on those that have mattered to Turkish migrant organisations in the Netherlands. The aim here is to provide some background to a bewildering political landscape. The empirical core of the paper, which follows, is divided into three parts: the first concentrates on developments up to the fall of the Berlin wall, a watershed for the left in Turkey as well as for affiliated organisations in the Netherlands. The following two sections then focus on the period since the early 1990s, more specifically on the transnational ties of Turkish migrant organisations with (1) parties that are now legal in Turkey, and (2) with organisations that remain prohibited there. 1 Interview with a former Dev Yol activist in exile, Amsterdam, 6 October 2004. 9This quote is telling of the myriad Turkish left organisations and their presence in the Netherlands. The late 1960s and early 1970s was a period of intense activity for the Turkish left. Influenced by developments in Turkey, ideological differences within the international socialist movement, and internal conflicts, the ‘left movement’ broke into numerous splinter groups. With the arrival of refugees from Turkey, these groups came to be represented among Turks in the Netherlands. Figure 1 shows the evolution of the Turkish left since the 1960s (for the interest of clarity the table only shows groups that had or have representation in the Netherlands – these were, however, the most prominent players). See appendixes 1 and 2 for founding dates, orientations and abbreviations). Arrows leading straight from one party to the next (e.g. SGB to TDKP) indicate that movement succeeded one another. Arrows splitting off on the side (e.g. TDKP to TKİP) indicate that a movement split off an existing one. This is a simplified and updated version of the family tree published on http://broadleft.org/​tr_left_part_hist_diag.pdf, accessed in april 2007. 10Igor Livosky (1992) has authored an excellent study on the emergence and development of radical left parties in Turkey between 1960 and 1980. It analyses the rise of complex and fragmented legal and illegal left movements in the context of changing political opportunities, in which the military coups of 1960, 1971 and 1980 were crucial. The socialist movement in Turkey was completely banned between 1950 and 1960. In 1960, in the face of acute social, economic and political crisis, a group of patriotic military officers overthrew the government and adopted a new democratic and liberal constitution (1961). This paved the way for the surfacing of ideological currents that had long been suppressed. A legal left movement emerged in Turkey in which diverse left-wing radicals, social democrats, trade unionists and Marxists were active, stylizing themselves and the movement as ‘socialist.’ Only the official communist party TKP – which had existed since the 1920s – remained prohibited and operated clandestinely (Lipovsky, 1992: 1-3). 11Between 1961 and 1971 many members of the socialist movement acted through the legal Marxist workers party TİP, founded in 1961. Other non-party leftist groups set up their own organisations, which first supported but later clashed with the TİP. These groups represented a wide spectrum ranging from the left wing of the social-democratic CHP to underground Marxist organisations. The struggle between the various ideological currents and the electoral failure of the TİP in 1969 led to a crisis that split the TİP around 1971 (Lipovsky, 1992: 67-82 ; Poulton, 1997: 211). The most important product of this split was the emergence of the student confederation Dev Genç, in which many future leaders of leftwing organisations were active. 12But Dev Genç was short-lived. Within two years, it had splintered into small groups of revolutionaries each with their own organisations. They proliferated under the influence of external events such as Mao’s radicalism in the Cultural Revolution of the late 1960s and the student revolt in Paris of 1968 (Poulton 1997: 211). Given the political climate, the Turkish extreme left increasingly came to advocate armed struggle; their acts of terror helped plunge the country into the chaos that led to the coup of 12 March 1971 (Lipovsky 1992: 1). The declaration of martial law in major urban areas and in the provinces where Kurdish nationalists were active paralysed political life: youth organisations and meetings of professional organisations and unions were banned (see Ahmad, 1993; McDowall, 1996). New groups – both Maoist and Marxist-Leninist – appeared, with former Dev-Genç cadre dissolving into the various splinter groups. 14The struggle between left and right, however, was unequal. This was due not only to their numbers (60 000 armed militants on the left against 100 000 on the right), but to the police and security forces having become the preserve of the nationalist party MHP. With the MHP in government between 1974 and 1977, and then again under Prime Minister Bülent Ecevit, the police and security forces were heavily infiltrated by MHP sympathizers. This protected the Grey Wolves, the MHP’s youth movement (Landau, 1981; Zürcher, 2004:263 ; Pope and Pope, 1997: 132). 15By the end of the decade, violence no longer only consisted of reciprocal killings by left and rightwing extremists. Both groups began to kill public figures, such as the deputy chairman of the MHP and a leftist trade union leader. Whole neighbourhoods came under the control of one or the other of the competing groups and were declared ‘liberated areas’. With the authorities seemingly unable to restore order, and with the economy in crisis, the army returned to power on 12 September 1980 (“ınar and Arıkan, 2002: 28; Zürcher, 2004: 264). 16All power was now in the hands of the military. Under a new law on political parties, politicians were banned from politics for ten years and their parties dissolved. Political leaders were arrested; parliamentarians and local administrators discharged. A state of emergency was declared throughout the country, from which no one was allowed to leave. Furthermore, anti-terrorist campaigns no longer only targeted leftist activists, but the MHP and the Grey Wolves as well. By 1982, 80 000 people were imprisoned and torture was widespread (Zürcher, 2004: 278-280). 17The military interventions of 1971 and 1980 heavily influenced leftist strategy. Most groups continued their activities in exile or illegally in Turkey itself. The activities of the Moscow-oriented communist party TKP, officially prohibited from the late 1960s until 1975, were mainly based outside Turkey. The party was directed from cites in socialist countries like Moscow or Prague, where TKP leaders resided (see Landau 1974: 105). Due to the increasing population of Turkish workers and refugees, Europe – and especially Germany – became the main exile base for leaders of illegal left parties in the late 1970s and 1980s. 18A civilian government replaced the military after general elections in November 1983. In contrast to the previous return to civilian rule, these elections did not fully restore the political freedoms that had existed prior to the 1980 coup (Lipovsky 1992: 167). With its figureheads either in jail or in exile, the left now remained excluded from the legal political arena. While the political spectrum had broadened again by 1987 (old leaders were running political parties behind the scenes and making still officially illegal political statements), it was not until 1993 that political parties were allowed to re-open using their traditional names (Argun, 2003: 140; Güneş-Ayata, 2002: 106). 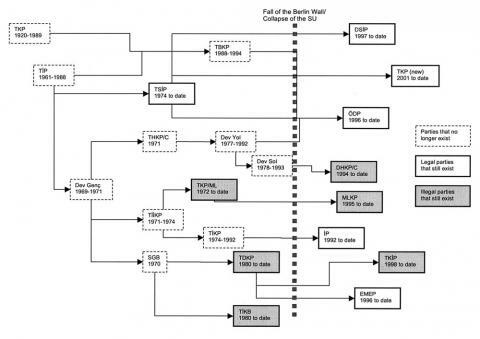 In the meantime, internal divisions and ideological confusion following the fall of the Berlin wall in 1989 had reduced the ranks of the left (Østergaard-Nielsen, 2003: 49). 19The early 1990s witnessed the founding of new parties, many of which had their origins in the late 1960s student movement Dev Genç. Though their memberships were small, they represented the full spectrum of ideologies that had been present in the 1970s. A group sympathetic to Mao and Albanian communism were organised in EMEP. A wide range of illegal radical left parties also arose, the most important of which were the Revolutionary Peoples Liberation Front, DHKP/C, and the Marxist Leninist Communist Party, MLKP (Østergaard-Nielsen 2003b: 50). Today, groups that used to follow the Moscow-oriented communists are mainly represented in the legal ÖDP. 20The choice to continue politics within a legal or illegal party obviously affected strategy. Legal parties, including EMEP and ÖDP, participated in the 2002 general elections, though none passed the ten per cent threshold. Wishing to improve upon their negligible success in electoral politics, many of these parties have increasingly come to emphasise international mobilisation, for example through participation in international anti-globalisation movements such as the World Social Forum (Baykan and Lelandais, 2004: 520). 21In contrast to the legal left, radical groups such as DHKP/C and the MLKP have continued the violent strategies of their forerunners and retain their armed wings. Like their predecessors, some of their leaders live in exile in Europe. Party programmes also resemble earlier ones. DHKP/C, for example, aims to organise people in Turkey into people’s councils to build a mass movement (DHKC, 1998: 142) in order to beat ‘fascism and state terrorism’ (Kurtulus, 1997: 149-151) through ‘democratic’ revolution. ‘If necessary the people will fight for justice’ (DHKC, 1998; DHKP, 1995; DHKC, 1998). One of the most visible activities of the DHKP/C and MLKP is their support of prisoners detained for activities within their respective parties. Protesting against the suppression of a prison rebellion, DHKP/C killed a businessman in Istanbul in 1996 (Pope and Pope, 1997: 127). The non-governmental organisation TAYAD supports DHKP/C and MLKP militants by reporting on hunger strikes, cases of torture and on missing members (TAYAD Solidarity Committee, 2001). TAYAD further supported the DHKP/C and MLKP ‘Death Fast Resistance’ of prisoners protesting prison reforms to detain them separately (Anderson, 2004: 823). Between 2000 and 2003, more than 2 000 prisoners participated in the ‘Death Fast Resistance’; 107 died (Anderson 2004: 817). After intervention by the security forces to suppress the strikes in 2001, relatives and friends of the striking prisoners began solidarity death fasts in Istanbul (Kulaksiz, 2003). 22Leftwing organisations established by migrants mirrored political developments in Turkey. Emigration to Western Europe in the 1970s offered banned parties such as the TKP a liberal political climate for the mobilization of guest workers (Landau, 1974: 105; Turkije Informatie, 1978: 23). In many cases they aimed to recruit workers in Western Europe so that their movements would be strengthened once migrants returned to Turkey (for Germany see Miller, 1981). However, in the early 1980s – paralleling the situation in Turkey – radical left politics among migrants moved out of public view and into an atmosphere pervaded by rumour and intimidation. Many members of the Turkish community now feared taking strong political stands and did not want to be seen as part of any one particular political group (Penninx, 1980). 23The military interventions of 1971 and 1980 led to the arrival of Turkish political migrants in Europe, individuals who had been members of revolutionary organisations in Turkey and who now brought their political convictions with them (for Germany see Miller, 1981: 53-54). In contrast to the political refugees of the 1980s, refugees after the 1971 coup did not ask for asylum but arrived in the Netherlands more or less ‘unnoticed’ as ‘guest workers’ (Bakker, Vervloet and Gailly, 2002: 212). Young extreme right Ülkücü Ocakları leaders also sought political asylum in Europe to escape the left-right violence in the schools and universities (see also Van Esbroeck, 1979; Geerse, 1998). In this way, conflict between the left and right in Turkey was transplanted to the Netherlands. 24The focus on Turkish politics among leftist migrant workers increased dramatically after the coup in 1980. Political refugees swelled their ranks. Mirroring internal and ideological divides in Turkey, a wide spectrum of radical leftist groups continued their activities in exile and mobilized workers for their party in Turkey. Each of these parties had its own network with members throughout Europe (see also Özcan 1992). In the Netherlands they organised activities against the Turkish junta separately, cooperating instead with their counterparts in Germany. They demonstrated in front of national parliaments, organised hunger strikes and shared their views of political developments in Turkey with the European public and governments through magazines and pamphlets (see for Dev Yol Turkije Informatie, 1981; for Dev Sol Turkije-Nieuws, 1981). 25To illustrate these developments, the next subsections describe how political orientations were reflected by Turkish migrant organisations. Although numerous organisations were founded in this period, we focus exclusively on two organisations that exist to this day. The first, HTİB, represented Moscow-oriented communism and was founded in response to the 1971 coup; the second, DİDF, was Maoist-oriented and a response to the coup of 1980. 26The first leftist organisation for Turkish labour migrants in the Netherlands, HTİB, was established in 1974 by a group of Turkish workers and refugees who had fled the military repression of 1971 (Can and Can-Engin, 1997: 66). With its Marxist orientation, the HTİB sympathised with the communist party of Turkey, TKP. HTİB’s initial goal was to include migrant workers living in the Netherlands within the Turkish people’s struggle for a democratic Turkey. At the same time, HTİB assisted Turkish migrant workers in their ‘struggle’ for rights in the Netherlands. 27The ‘struggle’ in the Netherlands included activities against the establishment Turkish organisations. Paralleling developments in Turkey in the 1970s, leftwing Turkish groups in the Netherlands fought one another as well as rightwing groups (Turkije Informatie, 1977; Rath, 1985). In 1977 HTİB campaigned to ban from the Netherlands organisations of the Grey Wolves which sympathized with the Turkish nationalist party MHP (Turkije Informatie 1977a). At the same time HTİB was opposed by smaller Maoist groups who viewed both the TKP and HTİB as representatives of ‘social fascism’. 5 interview with HTİB chairman and former member of Dev Yol and the TKP, Amsterdam, 19 October 2004. 6 Interview with former TİP, TKP, DİSK, PKK, HTİB and HTKB member, Istanbul, 19 January 2004. 30Although TKP adherence was prominent among HTİB members, it is important to note that the Moscow-oriented TKP was not the only party with which they sympathised. For example, the present chairman of HTİB, a member of the TKP in the Netherlands in the 1980s, was active in the Albania-oriented Maoist party Dev Yol when living in Turkey. One member of the TKP administrative board who continued her activities within HTİB was previously active in the workers party TİP and the Kurdish workers party PKK. Dev Yol adherents were to be found in Turkish workers organisations throughout the Netherlands, not only within HTİB. In the mid-1980s, TKP members within HTİB tried to work together with exiles from other political movements (see also Turkije Informatie, 1978). An umbrella organisation in exile was created in 1986, made up of individuals from the TKP, Dev Yol, PKK, and the workers parties TSİP and TİP. Due to internal and ideological conflicts, however, it quickly dissolved.7 Despite the ideological and personal conflicts, involvement in Turkish movements in exile became the basis for long-term friendships, as will be seen in the next section. 31Only a year later, in 1987, the TKP at a meeting in Brussels merged with the Worker’s Party of Turkey (TİP) to become the United Communist Party of Turkey (TBKP). Although the penal code still made communist politics illegal in Turkey, Prime Minister Özel hinted that restrictions might be lifted. The leaders of the TBKP returned to Turkey on 11 November and were jailed upon arrival (Zürcher, 2004: 284-285). 8 Interview with HTİB chairman and former member of Dev Yol and the TKP, Amsterdam, 19 October 2004. 32The TKP dissolved in 1989 after the fall of the Berlin wall.8 Internal TKP conflicts over the merger with TİP heavily influenced HTİB in the Netherlands, whose members were mainly comprised of first generation labour migrants attached to the TKP. When the TKP merged with the TİP, many members left the organisation .9 Dev Yol-affiliated organisations in Germany also began to redirect their efforts towards migrant issues (Özcan, 1992). 33Around the same period, HTİB concluded that the ‘temporary’ stay of Turkish labour migrants in the Netherlands had become permanent. The organisation accordingly redirected the focus of its activities from Turkey to the Netherlands (Van den Meerendonk and Tilburg, 1988). HTİB thus began to cooperate with Turkish organisations of different political colours through the IOT, the Consultative Council of Turks of the Dutch government. IOT represents a variety of Turkish migrant federations that, like HTİB, are rooted in the turbulent 1970s. Although the various groups have clashed in the past and their previous political orientations remain visible, their common position as Turkish migrants in the Netherlands brings them together in the IOT. To prevent conflict based on ideological differences, IOT members do not discuss Turkish politics during meetings. 34Before the 1980 coup, a small but militant group following Albanian communism was active in the Netherlands (its European headquarters was in Germany). With the arrival of Revolutionary Communist Party of Turkey (TDKP) cadre in the Netherlands after the 1980 coup, the federation DİDF was founded in 1985 (Van Zuthum, 1994: 24; Den Exter and Hessels, 2003: 11). Its independent sister organisation in Germany had existed since 1980 (see also Özcan, 1992: 261-264). The official aim of DİDF in Germany was twofold: to represent the interests of Turkish workers and to support the reinstallation of democracy in Turkey. In practice, it mainly organised activities against the junta in Turkey. 10 Interview with DİDF chairman, Amsterdam, 15 July 2004. 35Although political refugees affiliated with the TDKP established the DİDF, the former’s influence on the latter remains unclear. Together with radical Dutch anti-racism organisations, DİDF since its foundation has championed full equality for foreigners. With respect to Turkey, DİDF has supported repressed groups and individuals, mainly Kurds (Van Zuthum, 1994: 24); the organisation pleads for the Kurdish right to self-determination and the acknowledgement of Kurdish rights in Turkey.10 Likewise, one of its goals in the Netherlands is to contribute to full equality and participation of all people from Turkey (De Voogd and Van der Meulen, 2002). DİDF argues that the Turkish immigrant community is (ethnically) divided through the interference of the Turkish government via its consulates; it further criticises the Dutch government for directing policies towards ‘ethnic’ Turks and not for people from Turkey, thereby excluding Kurds from full participation. This is one reason why DİDF (as opposed to HTİB) is not a member of the Consultative Council of Turks in the Netherlands, IOT. 11 Interview with HTİB chairman and former member of Dev Yol and the TKP, Amsterdam, 19 October 2004. 36Since the late 1980s HTİB and DİDF have concentrated their activities on the position of Turkish migrants in the Netherlands. Both have become active in immigrant politics, while their members have started to represent Dutch parties in local politics.11 But while HTİB has abandoned its mission towards Turkey, DİDF has not. How does the HTİB’s sole focus on the Netherlands and the DİDF’s focus on both Turkey and the Netherlands influence their transnational ties with groups in Turkey? 15 Interview with ÖDP co- founder and member of the party assembly, Ankara, 11 November 2004. 18 Interview with ÖDK NL chairman, Amsterdam, 6 October 2004. 19 Interview with ÖDP co-founder and member of the party assembly, Ankara, 11 November 2004. 39Furthermore, ÖDP receives electoral support from ÖDK Europe. In 2003, ÖDP leaders toured in Europe to ask for assistance in campaigning for the 2004 local elections.17 In response, ÖDK members organised trips to Bahadin (Yozgat province, Central Anatolian Region) and Hopa (Artvin province, Black Sea Region). They arrived in cars with Dutch plates to show they had come all the way from the Netherlands in support.18 Those with Turkish passports voted. Those who stayed in Europe contacted their friends and relatives in Turkey and advised them to vote for ÖDP.19 The ÖDP in Turkey also entered the 2004 local elections under the banner of the social democratic party SHP. While the alliance united small parties like EMEP, the Kurdish party DEHAP, ÖDP and the social democratic SDP, it proved difficult for organisations that supported these parties to campaign together in the Netherlands. 41Why is a small party like ÖDP so well-organised in Western Europe? Much of the explanation lies in the previous involvement of its European followers in the illegal, Albania-oriented Maoist party Dev Yol. Connected via dense networks, former Dev Yol supporters over the years established numerous organisations that now form the basis of the European branch of ÖDP. Many ÖDP members have lived in exile in Western Europe, and maintain contacts with fellow party members who opted to settle in Europe permanently. And with the prominence of returnees in the party, the ÖDP supports policies that favour Turks living abroad. 22 Interview with DİDF chairman, Amsterdam, 15 July 2004. 23 Interview with EMEP chairman, Istanbul, 13 February 2005. 42Thus contacts of present HTİB members with Turkish political parties continued on a personal level, with former Dev Yol cadre creating an official solidarity committee for the ÖDP. Although there is insufficient information to compare past and present contacts with political parties of the formerly Albanian oriented federation, DİDF, the latter’s transnational trajectory clearly differs from that of HTİB and former Dev Yol cadre. Reflecting developments in Turkey, individual members of DİDF now support EMEP (both this Turkish party and DİDF were founded by former TDKP cadre). Although DİDF has no formal ties with EMEP, its members maintain regular contact with the party in Turkey, with the DİDF’s chairman visiting EMEP congresses in Turkey and EMEP’s leader regularly lecturing at DİDF gatherings.22 Both EMEP and DİDF have similar stances on Turkish politics and Turkish migrants in Europe, for instance on the desirability of Turkish workers to fully participate in political parties and trade unions in the Netherlands23, and on the position of Kurds (in both Turkey and the Netherlands). This is explicitly reflected in DİDF being an organisation for migrants from Turkey, rather than one for ethnic Turks. 24 Interview with DEHAP Vice-President, Ankara 10 December 2004. 25 Interview with DİDF chairman, Amsterdam, 15 July 2004. 44This section has traced the development of the transnational political ties of Turkish workers’ organisations in the Netherlands such as HTİB and DİDF after the revolutionary parties they sympathized with lost importance or became the basis for new legal political parties in Turkey. It further illustrated how former Dev Yol cadre in the Netherlands – the group that took to the streets in Turkey to fight right-wing movements in the 1970s – remained loyal to the movement by establishing an official branch of the Turkish party that has its own roots in Dev Yol. HTİB’s sole focus on the position of migrants in the Netherlands and DİDF’s aim of promoting change in Turkey is reflected in the development of their relations with Turkish political parties. While the ties of both organisations with Turkish political parties have weakened, they have also evolved quite differently. HTİB’s transnational political contacts have become personal in nature, while those of DİDF remain (though not formally) on an organisational level. 45The strategies of leftwing parties established in the 1990s that remain illegal in Turkey are similar to those seen in the 1970s and 1980s. Leaders reside in exile in European countries, where they more or less freely continue their activities. They have created party branches in European cities, connected through dense networks, and have become active in migrant politics and organisations. They try to pressure the Turkish state by lobbying national governments and European institutions. This section traces the activities of the two most important groups, DHKP/C and MLKP. 46As figure 1 shows, DHKP/C originates in Dev Yol but broke away a year after its founding to establish DHKP/C’s forerunner Dev Sol. Although Dev Sol activists were clearly represented in the Netherlands and Europe in the 1970s and 1980s – they had their own bulletin – it is unclear whether they were represented in any Turkish organisation. Studies on Germany show that Dev Yol headquarters publicly distanced itself from Dev Sol (Özcan, 1992). 47Regarding the forerunners (TKP/ML) of the MLKP, we only know that adherents founded a federation in Germany in 1977. We do not know where and how they were represented in the Netherlands. The reason for this gap in the data stems from the illegality of these parties in Turkey itself. In 2000 DHKP/C was put on the list of European terrorist organisations, though it was only outlawed in Germany and the UK. This meant that it was difficult to find representatives in the Netherlands. When I did, they were quite reluctant to talk. Thus in addition to the more conversation-like interviews I had with sympathizers of these two parties, I used secondary material including their pamphlets, websites, publications, newspaper articles and went (with them) to demonstrations to conduct participant observation. For security reasons I did not search for these groups in Turkey, as I did for the other parties. The analysis of their strategies begins around their foundation in the mid-1990s when they chose to continue an illegal revolutionary course. 28 Interview with a spokesman of Press Agency Özgürlük, Amsterdam 17 September 2004. 29 http://www.dhkc.info/668.0.html, accessed on 4 May 2006. 31 Interview with Grup Yorum representative, Istanbul, 8 January 2005. 48In the Netherlands DHKP/C sympathizers follow a peaceful path; several dozen are actively involved in the party (AIVD, 2004: 26). A branch of the party was located in Amsterdam between 1995 and 2003 but has since moved to Brussels.28 Nevertheless, DHKP/C followers openly show their affiliation with the party. On 1 May 2005 they marched through the city of Rotterdam carrying flags of the party.29 DHKP International, headquartered in Brussels, celebrated the anniversary of the party in the Netherlands in 2002 and 2005, where they commemorated their revolutionary martyrs including THKP founder Mahir Cayan.30 The music group GrupYorum often performs during these celebrations. In its political songs, the band criticizes the Turkish state and expresses its solidarity with leftwing political activists and prisoners. Because the Turkish state considers Grup Yorum a part of DHKP/C, some musicians have been imprisoned while others have found refuge in Europe.31 News and books on activities of the DHKP/C are published by Press Agency Özgürlük in Amsterdam. 33 Interview with a volunteer for the Anadolu Kultur Merkezi, Rotterdam, 6 October 2004. 35 Interview with a spokesman of Press Agency Özgürlük, Amsterdam 17 September 2004. 36 Press Release ‘Tayad stuurt brief naar Tweede Kamer’, TAYAD Komite, 13 November 2001. 37 Interview with a volunteer of the Anadolu Kultur Merkezi, Rotterdam, 6 October 2004. 38 Observations of the author during TAYAD demonstration in Brussels, 21 October 2004. 51In the Netherlands, DHKP/C is organised around the Dutch branch of the Association for the Support of the Families of Prisoners, TAYAD. The Dutch branch of TAYAD raises funds for the organisation in Turkey35 and attempts to influence the Dutch government by writing letters to parliament.36 DHKP/C adherents in the Netherlands have further organised hunger strikes in solidarity with the Death Fast Resistance in Turkish prisons.37 In 2000 a hunger strike in Rotterdam was dramatically interrupted when one of the participants was killed by Turkish nationalists. The relationship between TAYAD and DHKP/C became very visible during a demonstration of the European TAYAD branches in Brussels in 2004.38 This demonstration in solidarity with the Death Fast Resistance was attended by DHKP/C members in exile, representatives of the International DHKP/C headquarter in Brussels, and the Anatolian Cultural Centre. The demonstrators protested in front of the European parliament and the Turkish embassy holding photos of hunger strikers who had died in Turkey while shouting the names of DHKP/C ‘martyrs’. 39 Hayat ve Sanat invitation, Den Haag, 8 October 2005. 40 See also http://thecaravan.org/files/caravan/Berber_de.pdf, accessed in May 2006. 53Interestingly, the branches and members of the illegal parties mentioned in this section and the representatives and sympathizers of the legal Turkish parties all participate in the Dutch demonstration platform Keer het Tij. This platform – which unites roughly 500 leftwing organisations and parties – was founded in 2002, a response to the more conservative Dutch government that came to power that year. Sympathizers, members and branches of Turkish leftwing parties – the illegal parties MLKP, TKP/ML, TKİP and DHKP/C; the migrant organisations DİDF, HTİB and the Anatolian Cultural Centre; the branch ÖDK and the Turkish NGO TAYAD – were all present at a Keer het Tij demonstration in 2005.41 In their struggle for (what they consider) social justice, they have found common ground in protest movements in the Netherlands. 54To return to the central question of this paper: how can the different trajectories of transnationally active migrant organisations with a shared political orientation – in this case the radical left – be explained? The key explanatory factors revealed by existing scholarship are migration motives, political opportunities in the receiving country and the country of origin, and length of stay. These factors – while also applicable to the Turkish radical left in the Netherlands – need to be sharpened. 55As shown in this paper, changes in opportunities for the left in Turkey influenced ties with migrant organisations in the Netherlands. In the 1970s and 1980s the Turkish left as a whole was formally excluded from political participation in Turkey. Leftwing political movements continued their activities in Turkish labour organisations and branches in exile, connected through dense European networks. Their activities, networks and strategies clearly reflected the specific context in which their sister organisations in Turkey operated. 56With relative political stability in Turkey in the 1990s, some radical left groups became legal parties. This influenced Turkish migrant organisations abroad: organisations that had sympathized with previously illegal movements in Turkey shifted the focus of their activities to the country of settlement. They not only realized most members would stay in the Netherlands permanently (as happened with other organisations); the shift was also due to the legalization of their sister movements in Turkey. Coordination from abroad was no longer necessary. 57Although migrant organisations maintained contacts with these newly-founded political parties, their transnational contacts differed substantially. Organisations that completely lost their mission towards Turkey only maintained contacts on a personal level. Where at least some homeland-directed purpose remained, more formal organisational contacts were kept alive. Finally, we see that the transnational contacts of Turkish parties founded by exiles who returned to Turkey are more likely to exist on an organisational level. 58The importance of organisational developments in the homeland for transnational politics becomes clear when this experience is contrasted with that of organisations that sympathized with Turkish parties and movements that remained illegal after 1990. The path of newly-founded illegal parties has echoed those of illegal movements in the 1970s and 1980s. They continue to politicize immigrant organisations – no longer those of temporary labour migrants, but the cultural organisations of permanent migrants. And like exiles in the past, their European networks are crucial as they lobby for the protection of the rights of their members in Turkey at national and European levels. 59Current ties between migrants and/or organisations and legal Turkish parties are mainly used to provide electoral support. Migrants only seem to have a voice in party matters and policy when the majority of the administrative board in Turkey has a migrant history as well. On the other hand, ties with illegal parties that continue to exist are still vital for the existence of these parties and their leaderships. 60What this shows is that transnational politics are not only a question of activities or loyalties that transcend national borders. The organisational networks that allow loyalties to be translated into activities are likewise transnational. What happens at the organisational nodes in the country of origin is thus often crucial for developments in the country of settlement. Indeed, many groups that are often seen unproblematically as migrant organisations have only become true migrant organisations after their sister organisations in the homeland chose a political path that made support from abroad obsolete. In this way, homeland politics cast an even longer shadow over transnational politics than is often acknowledged. 61Whatever trajectory leftwing Turkish organisations in the Netherlands have chosen over time, there is no indication that maintaining an interest in homeland politics today hinders integration in the Netherlands or threatens Dutch democracy. On the contrary – despite differences in ideology, whether supportive of legal or illegal parties in Turkey, or without organisational ties to Turkey at all – all groups under study participate in the same Dutch protest platform. This is a sign of integration in and of itself, since they are demonstrating – sometimes under the banner of a Turkish political party – to improve their position in the Netherlands. It could even be argued that previous and present involvement in homeland politics reinforces participation in the political arena of the country of settlement. 62To conclude, these findings suggest that we need to specify homeland-related factors that determine transnational political practices in the country of settlement. Instead of assuming that homeland ‘political opportunities’ similarly affect all groups, we need to ask how specific groups – even within a comparable political stream – are included or excluded from homeland political participation. Only then will we be able to explain how and why migrant organisations continue homeland-directed activities, redirect their interests to the country of settlement, or combine elements of both. AHMAD Feroz (1993) The making of modern Turkey, London/New York, Routledge. AIVD, ALGEMENE INLICHTINGEN- EN VEILIGHEIDSDIENST (2004) Jaarverslag 2003, Den Haag, Minsterie van Binnenlandse Zaken en Koninkrijksrelaties. AIVD, ALGEMENE INLICHTINGEN- EN VEILIGHEIDSDIENST (2005) Jaarverslag 2004, Den Haag, Ministerie van Binnenlandse Zaken en Koninkrijksrelaties. AL-ALI Nadje, BLACK Richard and KOSER Khalid (2001) Refugees and transnationalism: the experience of Bosnians and Eritreans in Europe, Journal of Ethnic and Migration Studies, 27 (4), pp. 615-634. ANDERSON Patrick (2004) ‘To Lie Down to Death for Days.’ The Turkish Hungerstrike, 2000-2003, Cultural Studies, 18 (6), pp. 816-846. ARGUN Betigül Ercan (2003) Turkey in Germany. The Transnational Sphere of Deutchkei, London, Routledge. BAKKER René, VERVLOET Luc and GAILLY Anton (2002) Geschiedenis van Turkije, Amsterdam, Bulaaq. BAYKAN Barış Gençer and LELANDAIS Gülçin Erdi (2004) Cross-readings of the anti-globalisation movement in Turkey and beyond. Political culture in the making, ISSJ UNESCO, (182), pp. 519-528. CAN Murat and CAN-ENGIN Hatice (1997) De zwarte tulp. De positie van Turken in Nederland, Utrecht, Uitgeverij Jan van Arkel. ÇINAR Alev and ARIKAN Burak (2002) The Nationalist Action Party: Representing the State, the Nation or the Nationalists?, in Barry RUBIN and Metin HEPER Eds., Political Parties in Turkey, London, Cass, pp. 25-40. DHKC (1998) Political Development in Turkey: The People on the Road to Power, London, DHKC Information Bureau. DHKC (1998) We Are Right. We Will Win, London, DHKC Information Bureau. DHKP (1995) Het program van de revolutionaire volksbevrijdingspartij, Amsterdam, Halk Kurtulus Uitgeverij. ESBROECK A. Van (1979) Grijze Wolven. Wat zijn dat?, Nijmegen, A. van Esbroeck Nijmegen. EXTER JAK Den and HESSELS T. (2003) Organisaties van minderheden, in J.E. Overdijk-Francis et al. Ed., Handboek minderheden, Houten, Bohn Stafleu Van Loghum, pp. 7/1050-1-34. FONER Nancy (2001) Transnationalism Then and Now: New York Immigrants Today and at the Turn of the Twentieth Century, in Héctor R. CORDERO-GUZMÁN, Robert C. SMITH and Ramón GROSFOGUEL Eds., Migration, Transnationalization, & Race in a Changing New York, Phiadelphia, Temple University Press, pp. 35-57. GEERSE Mirjam (1998) Turkse idealen op Nederlandse bodem. Een kwalitatief onderzoek onder ülkücü’s (‘idealisten’) in Nederland, Utrecht, Doctoraal scriptie Vakgroep Culturele Antropologie. Faculteit der Sociale Wetenschappen. Universiteit Utrecht. GUARNIZO Luis Eduardo, PORTES Alejandro and HALLER William (2003) Assimilation and Transnationalism. Determinants of Transnational Political Action among Contemporary Migrants, American Journal of Sociology, 108 (6), pp. 1211-48. GÜNEŞ-AYATA Ayşe (2002) The Republican People’s Party, in Barry RUBIN and Metin HEPER Eds., Political Parties in Turkey, London, Frank Cass, pp. 102-121. HALK KURTULUS (1997) Konterguerilla. Der Name Des Krieges Gegen Das Volk, Amsterdam, Halk Kurtulus Uitgeverij. KOOPMANS Ruud, STATHAM Paul, GIUGNI Marco and PASSY Florence (2005) Contested Citizenship. Immigration and Cultural Diversity in Europe, Minneapolis, University of Minnesota Press. KOOPMANS Ruud and STATHAM Paul (2003) How national citizenship shapes transnationalism: A comparative analysis of migrant claims-making in Germany, Great Britain and the Netherlands, in Christian JOPPKE and Ewa MOROWSKA Eds., Toward Assimilation and Citizenship. Immigrants in Liberal Nation-States, New York, Palgrave Macmillan, pp. 195-238. KULAKSIZ Ahmet (2003) Two Sisters’ Lives. Canan and Zehra, Amsterdam, Ozgurluk Publishing. LANDAU Jacob M. (1981) Pan-Turkism in Turkey. A Study of Irredentism, London, C. Hurst & Company. LANDAU Jacob M. (1974) Radical Politics in Modern Turkey, Leiden, Brill. LIPOVSKY Igor P. (1992) The Socialist Movement in Turkey 1960-1980, Leiden, Brill. MCDOWALL David (1996) A Modern history of the Kurds, London, I.B.Tauris. MEERENDONK H. Van Den and TILBURG P. (1988) Evaluatierapport van de HTIB, Tilburg, Instituut voor ontwikkelingsvraagstukken KUB Tilburg. MILLER Mark J. (1981) Foreign Workers in Western Europe. An Emerging Political Force, New York, Praeger Publishers. MLKP (2005) MLKP Internationales Bulletin. MOROWSKA Ewa (2003) Immigrant Transnationalism and Assimilation: A Variety of Combinations and the Analytic Strategy it Suggests, in Christian JOPPKE and Ewa MOROWSKA Eds., Toward Assimilation and Citizenship. Immigrants in Liberal Nation-States, New York, Palgrave Macmillan, pp. 133-176. ÖGELMAN Nedim (2003) Documenting and Explaining the Persistence of Homeland Politics Among Gemany’s Turks, International Migration Review, 37 (1), pp. 163-193. ÖZCAN Ertekin (1992) Türkische Immigrantenorganisationen in der Bundesrepublik Deutschland, Berlin, Hitit. ØSTERGAARD-NIELSEN Eva (2003) Transnational Politics. Turks and Kurds in Germany, London/New York, Routledge. ØSTERGAARD-NIELSEN Eva (2003) International Migration and Sending Countries: Key Issues and Themes, in Eva ØSTERGAARD-NIELSEN Ed., International Migration and Sending Countries. Perceptions, Policies and Transnational Relations, New York, Palgrave Macmillan, pp. 3-30. PENNINX Rinus (1980) Politiek extremisme onder Turken, Intermediar, 1/2 (Tussen wal en schip), pp. 61-70. POPE Nicole and POPE Hugh (1997) Turkey Unveiled. Atatürk and After, London, John Murray. POULTON Hugh (1997) Top Hat Grey Wolf and Crescent, London, Hurst. RATH Jan (1985) Migranten, de Centrumpartij en de deelraadsverkiezingen van 16 mei 1984 te Rotterdam, Leiden, Rijksuniversiteit Leiden. TAYAD SOLIDARITY COMMITTEE (2001) The Terror Report of Turkey 1980-2000, Bielefeld, TAYAD Solidarity Committee. TURKIJE INFORMATIE (1977) Verkiezingen en geweld. Vervolg dossier Grijze wolven, Turkije Informatie. TURKIJE INFORMATIE (1978) Balans van vier maanden Ecevit, Turkije Informatie. TURKIJE INFORMATIE (1978) Regeringswisseling, Turkije Informatie. TURKIJE INFORMATIE (1981) Devrimici Yol. Turkije Informatie, Turkije Informatie, (2). TURKIJE NIEUWS (1981) Turkije Nieuws. ÜLGER Mehmet (2002) Met stembiljet het vliegtuig in, Contrast, (34), pp. 10-11. VOOGD Barend De and Van Der MEULEN Koen (2002) Nuri Karabulut, landelijk voorzitter DIDF: ‘Wij zijn voor vrijwillige assimilatie’, Grenzeloos, (69), pp. Grenzeloos.org. ZÜRCHER Eric J. (2004) Turkey. A Modern History. New edition 2004, London, I.B. Tauris & Co.
ZUTHUM H. Van (1994) Plaatselijke Turkse organisaties in Nederland, Den Haag, IOT. 0.17% in 1999. Alliance with DEHAP in 2002: 6.23% of the votes - no seats. 1 This table is based on the websites: http://www.broadleft.org/​tr_left_part_hist_diag.pdf , http://www.broadleft.org/​tr.htm, http://en.wikipedia.org/​wiki/​ accessed in May 2006; the following studies: Igor P. Lipovsky, The Socialist Movement in Turkey 1960-1980 (Leiden: Brill, 1992); Ertekin Özcan, Türkische Immigrantenorganisationen in der Bundesrepublik Deutschland (Berlin: Hitit, 1992); Hugh Poulton, Top Hat Grey Wolf and Crescent (London: Hurst, 1997); DHKC, Political Development in Turkey: The People on the Road to Power (London: DHKC Information Bureau, 1998); Nedim Ögelman, ‘Documenting and Explaining the Persistence of Homeland Politics Among Gemany’s Turks’, International Migration Review 37, 1 (2003): 163-193.and interviews conducted by the author in Turkey and the Netherlands between 2003-2005. 2 An important party that originated in the leftist movement was the Kurdish party PKK. Since, Kurdish nationalism soon overshadowed leftist ideology of the PKK and the development of this party is a study an sich, the PKK is left out in this study. 3 HTİB archive International Institute for Social History (IISH), Amsterdam: http://www.iisg.nl/archives/en/files/h/10751062.php, accessed in May 2005. 4 The FİDEF brought together organisations in Europe that sympathized with the Turkish Kemalist party, CHP, and the confederation of socialist trade unions, DİSK. In those days DİSK attracted CHP as well as TKP followers. Turkije Informatie (1978) Regeringswisseling, Turkije Informatie. On the FİDEF inauguration congress representatives of DİSK and the CHP held speeches. The highlight of the event was a taped speech of the CHP leader Ecevit. Turkije Infomatie (1977) Verkiezingen en geweld. Vervolg dossier Grijze wolven, Turkije Informatie. 9 HTİB archive International Institute for Social History (IISH), Amsterdam: http://www.iisg.nl/archives/en/files/h/10751062.php, accessed in May 2005. 13 Interview with ÖDK NL chairman and former Dev Yol activist and HTİB chairman, Amsterdam, 6 October 2004. 16 Interview with ÖDK NL chairman, Amsterdam, 6 October 2004 and interview with ÖDP co- founder and member of the party assembly, Ankara, 11 November 2004. 17 Notes of meetings of ÖDP Europe: 4-5 January 2003, 8-9 May 2004 in Basel, Switzerland; 15-16 November 2003 in Paris, France; 31 January-1 February 2004 in Mainz, Germany. Received by email from ÖDP co-founder and member of the party assembly, November 2004. 20 Interview with the coordinator of Bahadin committees in Europe and Turkey, advisor of mayor of Bahadin and former Dev Yol activist, Ankara, 11 November 2004. 27 Interview with a journalist of Evrensel, Istanbul, 9 August 2003 and with DİDF chairman, Amsterdam, 15 July 2004. 30 http://www.dhkc.info/DHKC_International.435+M5682345ee0c.0.html and http://www.dhkc.net, accessed on 14 April 2006. 32 Personal communication with delegate from the UK at TAYAD demonstration in Brussels, 21 October 2004. 41 Observations of the author at Keer het Tij demonstration, The Hague, 24 September 2005. See also the list of member organisations at: http://www.keerhettij.nl/organisaties.htm, accessed in April 2007. Arrows leading straight from one party to the next (e.g. SGB to TDKP) indicate that movement succeeded one another. Arrows splitting off on the side (e.g. TDKP to TKİP) indicate that a movement split off an existing one.This is a simplified and updated version of the family tree published on http://broadleft.org/​tr_left_part_hist_diag.pdf, accessed in april 2007.